How can infinity be possible? How can we comprehend that an infinite number of things can exist in a universe that we live in? How can the space that is available for us to explore be infinite in size? We humans are used to think in numbers in terms of the resources that are available. And by no means we are used to believe that those numbers are infinite. Every object here on earth that we can hold within our hands is part of the resources we can run out of if we make use of it the wrong way. If we look at the starts then we do not know for sure that their number is infinite. For we can not see beyond the range that we are able to see today. It could be that at the basis, at the very foundation of that which constitutes our universe, the resources are not infinite, but instead a trick is used to create a universe that in its fulfillment behaves as a universe that is infinite. For that I can give you an example. If you know a bit about video games, then you should know that 3D worlds that are infinite in size are possible to exist when created in software. In software it is very much possible to create a map of a world that is infinite in size because at the extremities the map can repeat itself. If both the starting edge and the ending edge of the map are equal in shape, then the world map repeats itself seamlessly, so that a person does not notice the repetition unless he recognizes the environment from prior memory. A map can also be made infinite not by repetition, but by using clever algorithms, like fractals. Here the world can be infinite in size and be unique in shape no matter how long you travel in any given direction. In both these examples the number of resources is not infinite. No computer has an infinite amount of memory, no software application is infinite in size (number of bytes). As a matter of fact, such software programs can be written on very simple computers. Yet this example shows that despite the numbers not being infinite, we are able to create something that we experience as being infinite. 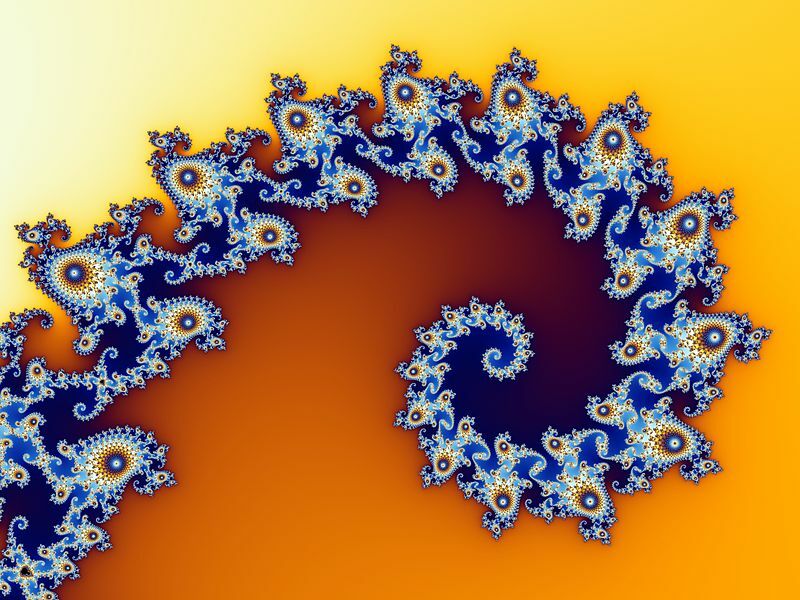 2D fractal. Image by Wolfgang Beyer, under CC BY-SA 3.0 license. Created with Ultra Fractal 3. 3D fractal. Image by Soler97 (Wikimedia), Created using Visions of Chaos. The universe being infinite could have at least two possibilities. One is that dimensionality is infinite in both directions, both in the yin (high dimensional) and yang direction (low dimensional), and that each further movement is movement towards new space. And likely this would apply to all the properties of dimensionality, which include the dimension levels and the scale size (yet not simultaneously linked together). The second possibility would be that there is some kind of loop somewhere, where both the dimension levels and the scale size repeat onto itself. In that case it could be that the galaxies that we see in the universe around us are nano-sized particles inside a living being, and that the emptiness of space is what we experience as a result of the large scale size, thus higher dimensional space, which to the perception of that living being is much denser because to him/her the scale size of 'our universe' is much smaller, thus lower dimensional. Then if we could build optical microscope far beyond the potential of that which is available today, we might actually find new life, entire civilizations, deep within a small sample of skin tissue. This is merely a hypothetical theory, one of many possible thoughts of what could be. A loop does not necessarily imply that a continuous movement in one direction makes you at some point end up at the exact same starting location, with the exact shape of environment. More likely would be that only one property of dimensionality repeats itself at that second reach of the starting point, but that in the meanwhile all the other properties of dimensionality are unequal to what it was. In that case the universe still repeats itself as if the environment we explore is completely unique. We won't find the exact same life forms, or the exact same worlds they inhabit, twice. In order to be able to explain many things that are either a result of vortex movement, or the cause of vortex movement, we need to consider the size of vortices. Vortices of similar type occur in many different sizes, and thus so does the entire transformation sequence in which these vortices are contained also occur in many different sizes. The transformation sequence occurs on the microcyclic, the mesocyclic and the macrocyclic scale levels. In each higher cycle in the sequence, the size of the vortices is larger than in the previous lower cycle. There is a possibility that the transition from one scale level to the next occurs within this progression of the transformation sequence itself. It could be that the mesocyclic scale level consists of a fixed number of cycles, before it progresses into the macrocyclic scale level, which is higher dimensional, thus might coonsist of a higher number of cycles. And prior to the cycles of the mesocyclic level should be a number of cycles that form the microcyclic scale level, which might consist of a lower number of cycles because of a simpler, less complex nature. If for example the number of mesocyclic cycles is 5, then the number of microcyclic cycles might be 4, and the number of macrocyclic cycles might be 6. Thus with these three levels, the transformation sequence repeats itself three times, yet not in the exact same way. The lower dimensions do not behave the same way as the higher dimensions. Small size does not behave the same as large size. The point of repetition, thus the point where one scale level transitions into the next, might be the zero point. Yet this is all uncertain. It is something we can suspect, but we need to find information that tells us if this is correct. It is not certain if the cycles of the transformation sequence actually do progress into a higher scale level. The increase in size of each higher cycle might be unrelated to the scale levels. One reason I think higher scale levels might consist of a larger number of cycles is because everything changes in the sequence. If all the scale levels would consist of 5 cycles for example, then within all the ongoing changes within the sequence with every movement we actually find a movement evolving around a constant number. I do not expect such a constant to exist. The reason for this is that everything changes, movement in one direction should always result in change of variables. The notion that everything in our universe is continuously undergoing change is something that has been mentioned more than once in our history by thinkers, writers and philosophers. Michio Kushi, a teacher and lecturer of yin and yang said, as he pointed out in one of the seven principles of the infinite universe, that "everything changes". Heraclitus said as one of his famous quotes: "There is nothing permanent except change". I can now say that this notion, or we might say, universal law, also applies to vortex movement, and it applies to the transformation sequence. We find the same types of vortices in the microcyclic scale, the mesocyclic scale, and the macrocyclic scale. They can look similar in shape but they're not quite similar. Larger vortices are more complex, more shape and movement, while the smaller variants are simpler in shape and movement. When a vortex morphs sequentially, its shape constantly changes to a new shape while also growing in size. The new shape is never any shape that it priorly was. Each new shape is always unique. The size of the vortices constantly changes, the number of meridians constantly changes. Each movement in the transformation sequence brings on a change. If we look at the world that we live in, if we focus on planet earth for a moment, then is apparent that everything within our world changes over time. All lifeforms change over time, evolve into newer lifeforms. Our climate changes over time, along with our ecosystem. The size of our earth changes over time. The speed at which our planet rotates changes over time. The distance to our moon, and the distance to our sun changes over time. Some of these things take a very long time to change, yet the change does happen. Some things might look almost similar over many, many years, but they're not completely similar, there's always change in everything. It is therefore likely, that the whole transformation sequence as we should be able to study today, the shape of the sequence as it is shown on the pages of this website, that shape too changes slowly over billions of years. Over millions of years its shape might be slightly different. Over billions of years its shape might not be recognizable as to what it is today. The reason to believe this is that there hasn't yet been found a single thing in our universe that does not change over time. Of many things we still do not know if it is affected by change, but by looking at patterns and everything that we do know about how anything is affected by time, we can assume that everything does change. Even when something remains, it keeps evolving and continues on in a new form. And most likely the transformation sequence itself, is one of the many things that evolves.